Matthew Flinders and George Bass were two obscure young men from Lincolnshire who arrived in Sydney in 1795 determined to achieve greatness. 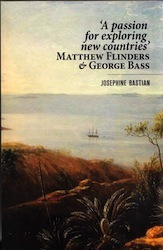 Flinders wanted to be an explorer ‘second only to Captain Cook’, Bass, another Sir Joseph Banks, and a rich Sydney trader. For eight years these two pursued their destiny. Their voyages changed the map of Australia, and Flinders gave it its name. Then it was all over. Bass set out on a voyage he would never finish; his life ended when he was thirty-two years old. On Ile de France (Mauritius) twenty-nine-year-old Flinders was thrust into prison as a spy and detained for six and a half years. This book is historically rigorous, yet its protagonists’ fascinating and contrasting characters and the extraordinary events of their lives against the powerful background of the Napoleonic War, make it as gripping as any novel.